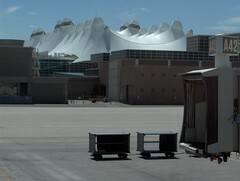 Denver International Airport, April 22, 2006 - If you're going to have a three-hour layover somewhere, you could do worse than Denver. Or at least they tell me I'm in Denver. I could be anywhere. But judging from the scenery, I'm actually nowhere. Flying in from the east you see nothing but flat farmland between here and Des Moines. And Denver is still about 40 minutes east of here. Well, it's a nice enough airport, as airports go. I'm on my way to Las Vegas to meet Sue. She has a conference there, and I decided at close to the last minute to join her. Which is why I had to get up at 6am and spend three hours here while her nonstop flight leaves four hours later and arrives in Vegas at the same time as mine.